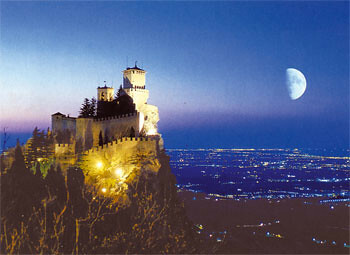 San Marino is an enclave microstate in Europe surrounded by the Italian peninsula. Its capital city is the city of San Marino and it has the smallest population of any country in the Council of Europe and it is the third smallest in Europe. The country sits on the border of the Emilia Romagna and Marche regions of Italy and about 6 and a half miles from the Adriatic Sea. San Marino has claimed to be the oldest sovereign state and constitutional republic in the world after being formed in September 301. The country is mainly mountainous as it sits in theApennines. There are no major bodies of water. The enclave is host to one Unesco World Heritage Site – the “San Marino: Historic Centre and MountTitano.” The climate is Mediterranean and has warm summers and cool winters. San Marino has is much like that of Italy such as the piadina but it has a very well-known cake known as the Cake of the Three Towers which is a layered wafer cake covered with chocolate. There are also unique dishes and a small wine industry. San Marino’s music tradition is long and rich. Among the bands from the country are Love Orchestra, a Gian Luca “Luke” Mazza new age music project.